This is the Gayos 1965 figure from the Gamera Classic high grade set. Amazing detail and color! This "High Grade" vinyl figure is approximately 2 ½ inches tall. Gayos 1965 has a wing span of approx 2 1/2 inches. CLAWMARK TOYS WARNING!! Small parts might be hazardous for very young fans. This is the SPACE GYAOS figure from X Plus. The figure represents the Monster Space Gayos that was featured in the Gamera film Gamera vs. Gurion. The figure is soft vinyl and has outstanding detail. This colorful figure stands approx. 8 1/2 inches tall and has a wingspan of approx. 14 inches. Comes Mint on Blister Pack. Some minor assembly required (use hair dryer to insert legs and wings). In this series, this is the HARDEST VERSION TO FIND EVEN IN JAPAN!! This is one of the most detailed Gamera 3 figures ever produced. Sculpted by Matsumura Shinobu and made by KAIYODO for XEBEC Toys of Japan, this Light Green Gamera is "BATTLE DAMAGED" and comes with a Redish Brown colored Hyper Gayos in FLYING POSE! The Gamera figure has Battle Damage on his shell and a big green/bloody hole in his chest where he was injured by IRYS in his Final Battle. 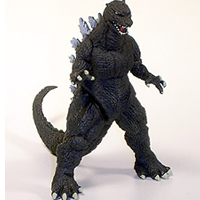 The Gamera figure stands approx. 5 inches tall and is approx. 7 inches long. The Hyper Gyaos has a wingspan of approx. 5 inches. Both figures are made of vinyl. Articulated on arms and jaw. This Battle Damaged Gamera 3 figure comes with interchangeable right arms. You can pose his with his regular arm or the STUMP that was left after his Arm had been cut off by IRYS! They used a lazer painting process on these figures and they are just amazing. These are not toys for younger fans. They are made for display or light play. Comes mint in Blister Pack. Produced in very limited numbers in 1999. Scroll down for additional photos. HYPER GYAOS 1ST. ISSUE ORIGINAL!! These are highly detailed vinyl figures for collectors of all ages and great for kids to play with!! They are made of thick flexible vinyl and can stand up to rough play. AWESOME DETAIL! HE LOOKS LIKE HE REALLY WANTS TO EAT SOMETHING...OR SOMEBODY!! Hyper Gyaos 1999 ORIGINAL PAINT version has a wing span of approximately 6 inches and is articulated at the legs. THIS IS A VERY HARD FIGURE FOR COLLECTORS TO FIND! COMES MINT WITH ORIGINAL "02" TAG. Scroll down for additional photos. Man Eating Gyaos!! 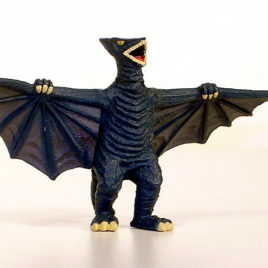 Made in 1998, this is the Marusan Spread Wing Gyaos figure. This colorful figure stands approx.7 inches tall and has a wingspan of over 9 inches. HE LOOK HUNGRY! Articulated at the head and legs, this Gyaos would make a great addition to any collection or would be lots of fun for play! Comes Mint in Bag with Header Card. Produced by Bandai in 1995 for the Movie Gamera Guardian of the Universe 1995 by Daiei is the Gyaos. This is an impressive Gayos standing 8 inches tall with a wingspan of 9 inches. He is in Near Mint Condition No Tag. 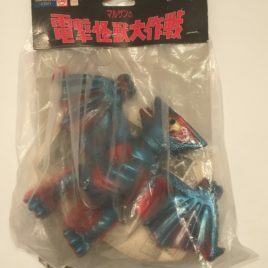 This is the Gayos 1995 figure from the Gamera Classic high grade set. Amazing detail and color! This "High Grade" vinyl figure is approximately 2 ½ inches tall. Gayos 1995 has a wing span of approx 3 inches. CLAWMARK TOYS WARNING!! Small parts might be hazardous for very young fans. 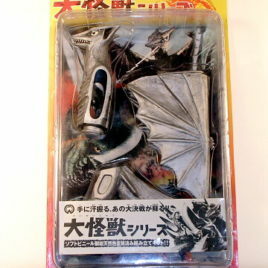 This is the Space Gyaos figure from the new 8 piece GAMERA CHRONICLES High Grade set. Amazing detail and color! These "High Grade" vinyl figures stand approximately 2 ½ inches tall. CLAWMARK TOYS WARNING!! Small parts might be hazardous for very young fans. High Grade figures "snap" together, but might need Super Glue for hard play! This is the Hyper Gyaos from the Gamera 3 high grade set produced by Bandai in 1999. Amazing detail and color! These "High Grade" vinyl figures stand approximately 2 ½ inches tall. This gashapon capsule series has been out of production since 1999! Hyper Gyaos has a wing span of approx. 3 1/2 inches. CLAWMARK TOYS WARNING!! Small parts might be hazardous for very young fans.